Not everything goes according to plan in live broadcasting, and Newsnight has had its fair share of bloomers. 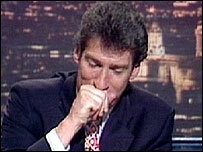 Here's a selection of Newsnight's funnier moments, mistakes, broadcasting disasters and, sometimes, the plain bizarre. Watch Jeremy relish questioning the World Cluedo champion about how to be on top of exactly who was it in which room and with which murder weapon? 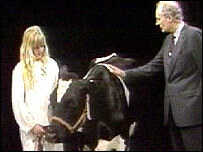 Peter Snow was one of the first to cover the BSE or "Mad Cow disease" story. Clearly, you couldn't have told that story on television without getting a real, live cow in the studio. Could you? And the person responsible for booking the cow? 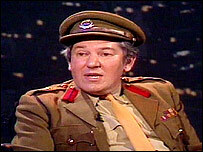 None other than current Newsnight editor, Peter Barron. 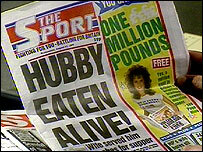 Still today Newsnight usually rounds off the programme with a preview of the next days newspaper headlines. Peter Snow: "Page three; not bad..."
Telephones were a headache for live broadcasters even before they become ubiquitously mobile. 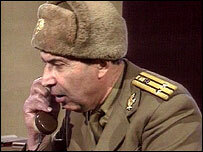 Interviewing a Romanian general surrounded by an array of telephones proved to be a challenge in this interview. When booking studio guests for a live interview, it's always advisable to check that they do speak the language they will be interviewed in. 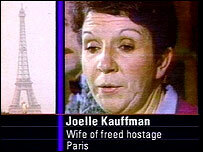 Despite Madame Kauffman's best efforts and the help of a friend, the interview had to be abandoned. An almost unbelievably exhaustive investigation into the lives, loves and trials of Britain's tortoises. 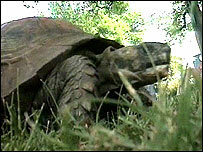 This film uncovers everything from stressed pets to tortoise rustling. Must be seen to be believed. Jeremy Paxman has guests ready to debate healthcare provision in the UK and has just started to voice the introduction to the programme live. 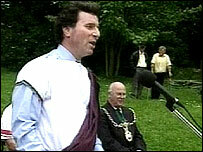 When Jeremy Vine set off round the country in 2001 to cover that year's general election from all corners of the country, he probably didn't think he'd be interviewing Oliver Letwin in a toga. Or that Billy Bragg would turn up dressed as a Roman soldier to promote tactical voting. Michael Crick was in Hartlepool seeing the sights and sounds of a town in the grip of by-election fever, after Peter Mandelson left for a new life as an EU commissioner. 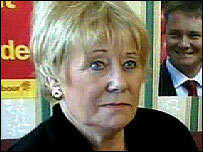 Among other celebrities Kevin Whately, Inspector Morse's TV side-kick, had been brought in to campaign for Labour, but Michael went one better. Are you the new DJ? 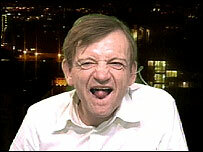 As current editor Peter Barron explains on his highlight section of this special anniversary website, when the news broke that John Peel had died, Newsnight had to interview his favourite band's frontman: Mark E Smith of The Fall. Gavin Esler talked to Mark E Smith about John Peel, his work and his legacy. Newsnight is broadcast every weekday at 10:30pm on BBC Two in the UK.